This is part of a large scale Critique of Dialectical Reason in which Sartre, French eminence grise, formally acknowledges Marxism as the 20th century's only philosophy and existentialism as a subordinate ideology working within it. The bases are suspect, the arguments shopworn. For Sartre, existentialism is a parasitical system living on the margin of Marxism; in the past it opposed it, now it seeks membership. And what is that but a parallel to Christian assimilation of pagan symbology? Truth is a becoming; totalization is what it becomes, and Marxism is "history itself becoming conscious of itself"- which is Hegelian double-talk all over again. Man is not unknowable: we must develop a "philosophical anthropology". The 18th century Idea of Reason and/or Pavlovian mechanics. 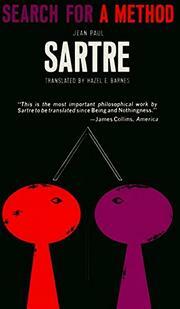 Of course Sartre is against both; more perplexity. The scarcity problem is both in economics and emotions and shall be eliminated through collective means; the new fundamental of freedom is Marxist need, not bourgeois desire. Thus, the further juggling of terms and terms. Contradiction is the dialectic and class structure is the contradiction; the capitalist crises produce proletarian class consciousness and rebellion. But except in pre-industrial situations such as Czarist Russia, where has that ever happened? In short, knowledge is Marxism and all of us are Marxists whether we like it or not. And what deep that resemble except Christ as the Indivisible Historical Truth? He died for you, boys; like it or not His death (the Incarnation/Resurrection) is your Meaning. All men are brothers, said Christ. There will be no classes, said Marx. And Sartre, self-hating petit-bourgeois, attempts to escape his class via the Marxist Good News. Unfortunately only the most rigorous, rapier-sharp scrutiny justifies such propositions being elucidated, elongated. And that's not here. Sartre's Method seems continually in double focus: polemical bursts of sunlight along with endless skywriting on a cloudy day. A cognoscenti conversation piece.